I follow the main feeds of a couple social news sites (namely Digg, Reddit and Muti). When I find an article which I like, I go back and vote it up on the site. However, when I come across good articles via other sources, I don't submit them to these news sites (or try to find out if they've already been submitted) simply because it's too much effort. When I started aggregating my activity on these sites on my blog and on FriendFeed, I needed a way to share pages that I didn't get to via one of these social news sites. I ended up setting up Delicious because I found a plugin for Konqueror which made it easy to bookmark pages. I still wanted to solve the original problem though, and so started looking for an easy way to submit links to these sites from Konqueror. Konqueror has a feature called service menus which allows you to add entries to the context menu of files. I then needed to work out how to submit links to these services, which turned out to simply involve loading a URL with a query parameter specifying the link you want to share. I created entries for Reddit, Digg, Muti, Delicious, Facebook and Google Bookmarks. These take you to the submission page of the service where you can fill in the title1. Digg and Reddit will show existing submissions if the link has already been submitted. 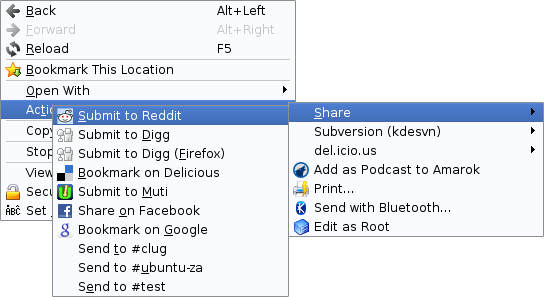 If you want to set this up yourself, download share.desktop and put it in ~/.kde/share/apps/konqueror/servicemenus. If you want the icons, download shareicons.tar.gz, extract them somewhere, and fix the paths in social.desktop2. To setup the IRC feature (assuming you're using WeeChat), download postirc.sh and save it in ~/bin/. You will need to change the commands in social.desktop depending on the servers and channels you wish to use.